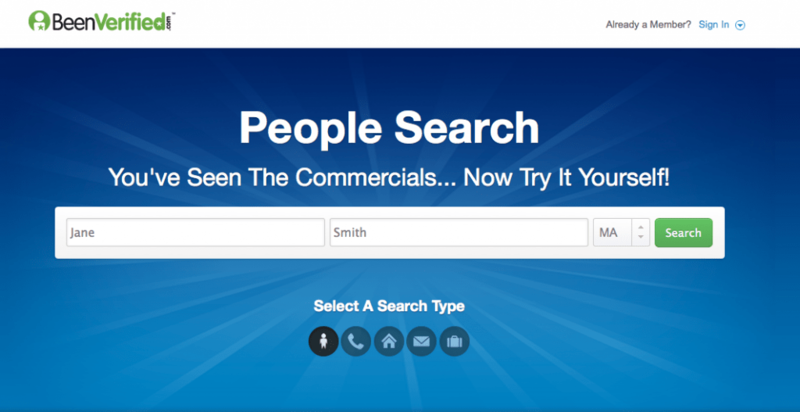 You probably haven’t heard of people search websites, but they know a whole lot about you. Also called “data brokers,” these websites make a business of collecting, publicly sharing, and selling your personal information on the Internet. 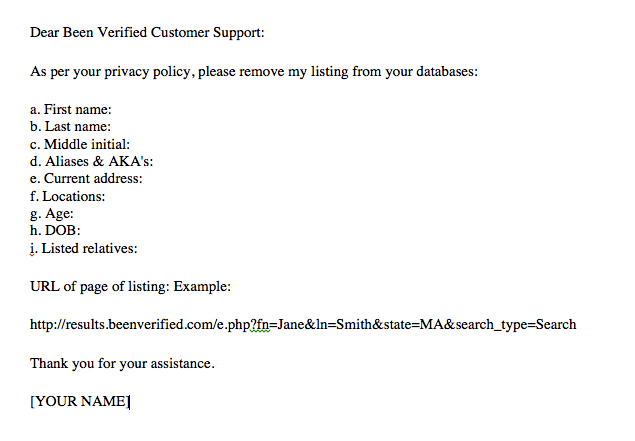 In this post, I’ll show you how to delete personal information from one of the largest people search databases on the web: BeenVerified.com. I’m Maggie; I help run our DeleteMe service, which takes the hard work out of removing personal data from the web, and I’ve become an expert on how to ensure your private info stays private. 2. 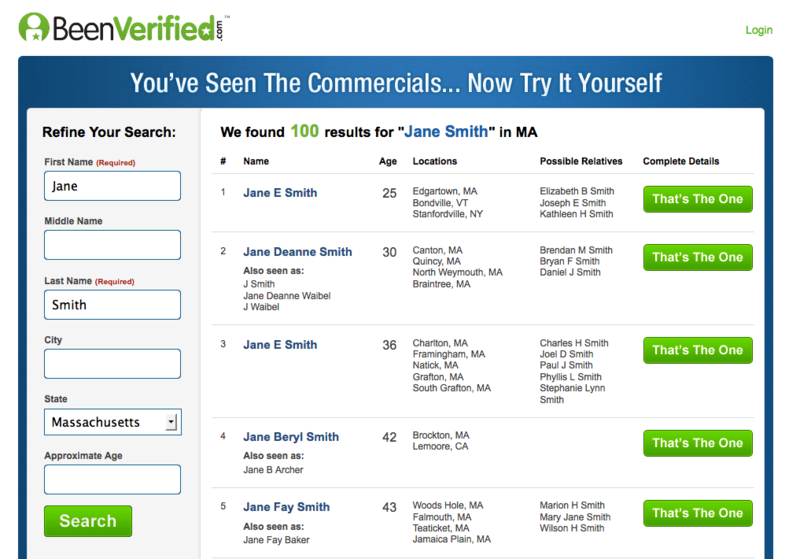 BeenVerified will show you the results page based on what you searched for. If you receive a large number of results, try entering your current city or age to refine the search. If the name and state combination you entered shows no results, enter another state you’ve lived in, and try searching again. Edit search fields on the left side of this page. 3. Once you’ve located your results, open up a new window and log in to your email account. 4. Create a new email to be sent to support@beenverified.com, with the subject line: “Opt Out Request.” BeenVerified requires you to include the following information in the body of your email: Full name, aliases, current and previous addresses, date of birth, age, listed relatives. Make sure to include ALL information found in the listing, even if it’s inaccurate. Your removal request could be denied if it does not include all information associated with your BeenVerified directory listing. 5. Send email. You’ll receive an automated response to your customer support inquiry, followed up by a confirmation that the listing will be removed in 7-10 days. 6. Success! Your information will be gone from BeenVerified’s database in about one week. Be sure to go back and check for your information periodically. BeenVerified is always collecting new public records and information about you, and inevitably your name will pop back up on their website at some point. Sound like too much work? Check out our DeleteMe service, which removes personal information from BeenVerified along with 17 other people search sites, and we’ll do it all for you! Do not publish my personal information please. if I have any published information on this site, please remove it. Please remove any information reference to me or any members of my family. Also, please stop billing me each month. I didn’t not sign up to be billed every month. I accepted a one time billing for information. STOP billing me! You did sign up for this service by following this bogus post. When you send all of your personal information to a bunch of criminals you help them refine their database about you and bill you for it! Send a complaint letter to the FTC and Better Business Bureau. If you would, PLEASE GET ME PERSONAL INFORMATION OFF. This was a one time thing. Please email us at deleteme [at] get abine [dot] com to receive help about this issue. Please remove any and all information related to me. This is a bit much don’t you think? I’ve checked several websites and my information is on quite a few of them. please remove me in its entirety. Not what I expected. Like so many sites everything I want cost more than the unlimited search. I don’t need a pdf file in my e-mail. All I really wanted was a detailed file that I could print. Please remove me from your site and cancel my subscription. My member ID is 374076225. Please remove me from “Been Verified”. I only needed it one time. The constant pop-up ia very annoying! MY NAME IS DENISE MALEWSKI AND I RECIEVED A PHONE CALL FROM YOU VERIFYING WHO I WAS. THIS WAS SEVERAL WEEKS AGO. I WOULD LIKE TO KNOW WHO IS LOOKING ME UP. I FEEL THIS IS AN INVASION OF MY PRIVACY. AND I AM CONCERNED ABOUT MY PROTECTION. I DID NOT GIVE ANY AUTHORIZATION TO DO SO,=. I WANT MY PERSONAL INFORMATION OFF YOUR WEB SITE NOW. Please stop my account.I am no longer in need of your service. please remove me and any info on diane rigdon or diane adams from my page.